From his office in Derik, 700 km northeast of Damascus, Hemo denounces a blockade allegedly enforced by the Kurdistan Regional Government of Iraq and Turkey over the Kurdish areas of Syria. “The latest proof of this is the ditch that Erbil (the administrative capital of Iraqi Kurdistan) is building along their common border,” notes the Kurdish official. The “ditch” is a 17 km-long trench, three metres wide and two deep, which comes on top of the recent dismantling of the bridge across the Habur river, at the only official border crossing between the Kurds of Iraq and Syria. Meanwhile, Al Qaeda affiliate groups, many of which are reportedly reaching the area through the Turkish border, have been maintaining a siege on the region since autumn 2012. “People are terrified and many have left,” Isham Ahmed, Derik resident, points out from his small grocery store in the bazaar. The shopkeeper, who refuses to fold his business despite the hardship, adds that food prices have increased fivefold because much is now smuggled, or simply because crops are unattended because of the war. Shortages of virtually everything are seemingly one of the prices to pay for the Syrian Kurds since they took over their areas in July 2012. Despite distancing itself from both government and opposition, Ankara still frowns on the Democratic Union Party, the dominant party among the Syrian Kurds, with an ideology akin to the Kurdistan Workers’ Party (PKK). On the other hand, the Erbil authorities accuse the new Syrian Kurdish administration of politically marginalising a significant part of the population. The excellent trade relations between Ankara and Erbil, which include significant gas and oil contracts, may also be a factor behind Erbil’s refusal to recognise the new status quo among their kin in Syria’s north. Meanwhile fuel in Derik has gone from the pre-war 50 Syrian pounds per litre (25 euro cents) up to 300. Petrol is brought from the myriad of makeshift refineries dotting the flat landscape; basically drums where the raw crude is distilled, and where individuals, often children, work under constant danger of explosion. Not surprisingly, vehicle engines collapse due to the poor quality of the fuel and many have to be towed to Qamishli, the main urban settlement in Syria’s Jazeera region, 600 km northeast of Damascus. “The main electricity line used to come from Raqqa (500 km northeast of Damascus) but not any longer because the city is under Al Qaeda control. In Qamishli, both the regime buildings and the airport enjoy 24 hours of power but it is just four for the rest of us so we rely on power generators,“ explains the 30-year-old official from the former Hadaya hotel, today hosting the Kurdish city council. A few hundred metres away, and without leaving the city centre, doctor Redovan Hamid also strives to meet the growing demands of his patients. “Medicines are scarce, or obsolete after being held in the Turkish or Kurdish Iraqi borders for too long. It’s outrageous,” adds the doctor. From the headquarters of the Kurdish Red Crescent – an organisation set up in the heat of the revolution but with no structural relationship with the International Red Cross and Red Crescent – regional delegate Agid Brahim subscribes to Hamid’s version. “We rely exclusively on the international community because our neighbours have given us nothing but their backs,” he told IPS. Yet there might be a small hint of hope. On October 26 last year, forces of the YPG (People’s Protection Units) seized control of the Syrian-Iraqi border post in Til Kocer (Yarubiya in Arabic), 700 km northeast of Damascus and 400 km northwest of Baghdad. The strategic spot, a main hub for trading between both countries for decades, had remained under control of Al Qaeda affiliate groups since March 2013. The next step was to resume operations between both sides, something which happened in late December, after a Kurdish delegation met officials in Baghdad. But cross-border traffic is still far from being fluid. “Goods need to be shifted from one truck to another because they are still not allowed to cross the border,” Redur Marzan, one of the new customs officials at this massive, yet empty, border complex tells IPS. Marzan talks of “just a few trucks a day” going through the painful process of shifting their load across the border. Safety, adds Marzan, is another key factor. “Most of the shooting we hear during the day comes from a YPG training camp close by but the Islamists are still in the area so we cannot drop our guard, especially at night,” admits this Kurd in his late twenties while he strolls among tons of dates rotting on the ground. A few metres behind him, a man in camouflage gear sweeps the main exit gate. On the other side of the fence, a solitary Iraqi soldier looks in boredom. 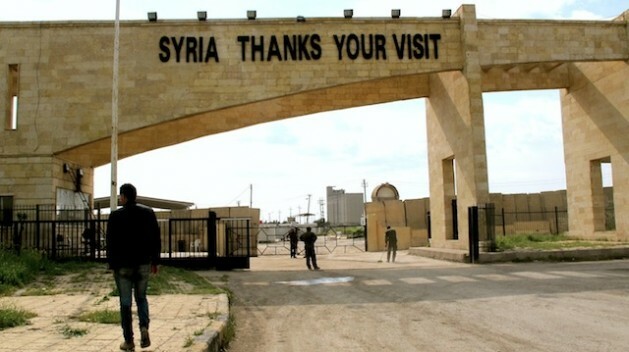 “Syria thanks your visit,” reads a sign over a border post that has yet to prove to be a real way out for a landlocked patch of land.